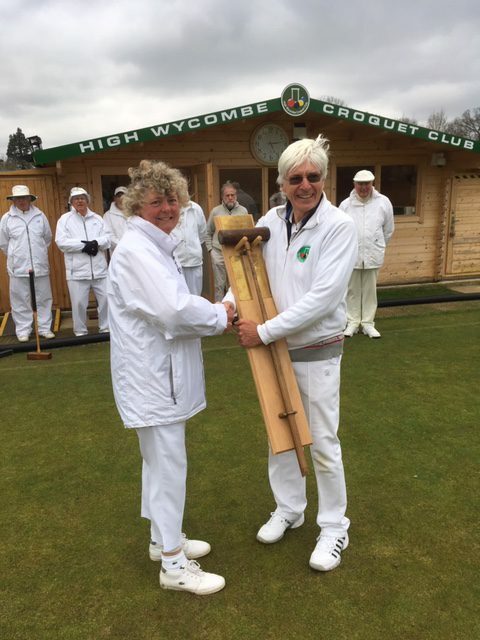 There was a dramatic conclusion to the annual season-opening friendly between High Wycombe and Ealing for the Lloyd-Pratt Mallet. This year it was Wycombe’s turn to play hosts, and their lawns were surprisingly fast for this time of year, though the weather remained resolutely chilly. Ealing won both morning GC matches, with the AC games shared. High Wycombe came back strongly in the afternoon, winning both AC games and one GC match. This left things all-square at 4 games all, which meant a shoot-out at the peg involving all 16 players was called for. Hits were exchanged, and when Ealing missed their last shot High Wycombe won 3-2. A splendid end to an enjoyable day, topped off by High Wycombe Chairman Richard Peperell regaling the assembled company over lunch with the story of the eponymous Brian LLoyd-Pratt’s colourful croquet career. Our picture shows Richard receiving the trophy from Bridget Goodman. Our warm thanks to High Wycombe for their hospitality.